Purchase a copy at Small Press Distribution or Amazon. Obsessively interrogating three hundred years of family history in Scotland and Maryland, Trafficke tracks and remixes questions of race and identity, fact and legend into a mosaic of verse, lyric prose, historical narrative, and quotation. 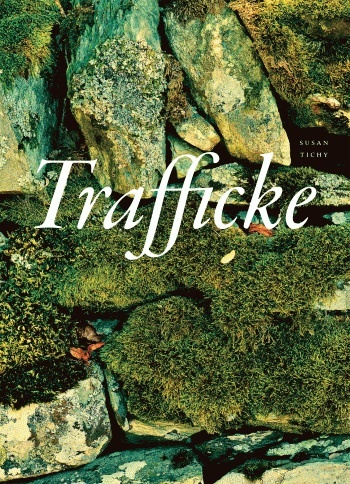 Twenty years in the making, Trafficke began with legends of origin, of persecution and survival, that cast their glamour—in the old Scottish sense of a spell, an illusion—over the poet’s ancestor, Alexander Magruder, obscuring the vicious reality of the family’s two hundred years of slave-owning in America. A Highland Scot transported to Maryland in 1652 as a prisoner of war, by the time of his death Magruder owned four indentured servants, twelve hundred acres of what had been Patuxent and Piscataway land, and one African man. As Trafficke strips away the glamour, it takes shape not as a simple uncovering of truth, but as a dis-spelling, a building and tearing down of identity’s various disguises, of power’s relentless self-justification, of the poet’s bitterness and complicity. Stepping forward and backward in time, sampling texts that range from 16th c. Gaelic poetry to runaway slave advertisements, the narrative pulls readers through a many-layered critique of ownership and the timeless seductions of beauty. Violence and language, literacy and desire—these too are characters in the lyrical, fraught, and grief-charged text of Trafficke. Trafficke has been taught at numerous colleges & universities, sometimes including a class visit or a conversation by Skype. To inquire about classroom contact, or to book a reading or workshop, please contact me through this site. Find upcoming Trafficke events on this page.